The dsp.FIRDecimator System object™ resamples vector or matrix inputs along the first dimension. The object resamples at a rate M times slower than the input sampling rate, where M is the integer-valued downsampling factor. The decimation combines an FIR anti-aliasing filter with downsampling. The FIR decimator object uses a polyphase implementation of the FIR filter. Create the dsp.FIRDecimator object and set its properties. firdecim = dsp.FIRDecimator returns an FIR decimator, firdecim, which applies an FIR filter with a cutoff frequency of 0.4*pi radians/sample to the input and downsamples the filter output by factor of 2.
firdecim = dsp.FIRDecimator(decimFactor,num) returns an FIR decimator with the integer-valued DecimationFactor property set to decimFactor and the Numerator property set to num. firdecim = dsp.FIRDecimator(___,Name,Value) returns an FIR decimator object with each specified property set to the specified value. Enclose each property name in quotes. You can use this syntax with any previous input argument combinations. Decimation factor, specified as a positive integer. The FIR decimator reduces the sampling rate of the input by this factor. The number of input rows must be a multiple of the decimation factor. 'Property' –– The numerator coefficients are specified through the Numerator property. 'Input port' –– The numerator coefficients are specified as an input to the object algorithm. To prevent aliasing as a result of downsampling, the filter transfer function should have a normalized cutoff frequency no greater than 1/DecimationFactor. You can specify the filter coefficients as a vector in the supported data types. This property applies when NumeratorSource is set to 'Property'. Specify the implementation of the FIR filter as either Direct form or Direct form transposed. true –– The object computes all internal arithmetic and output data types using the full-precision rules. These rules provide the most accurate fixed-point numerics. In this mode, other fixed-point properties do not apply. No quantization occurs within the object. Bits are added, as needed, to ensure that no roundoff or overflow occurs. false –– Fixed-point data types are controlled through individual fixed-point property settings. For more information, see Full Precision for Fixed-Point System Objects and Set System Object Fixed-Point Properties. Rounding method for fixed-point operations. For more details, see rounding mode. FullPrecisionOverride set to false, ProductDataType set to 'Full precision', AccumulatorDataType set to 'Full precision', and OutputDataType set to 'Same as accumulator'. Under these conditions, the object operates in full precision mode. 'Wrap' –– The object wraps the result of its fixed-point operations. 'Saturate' –– The object saturates the result of its fixed-point operations. For more details on overflow actions, see overflow mode for fixed-point operations. Same word length as input –– The word length of the coefficients is the same as that of the input. The fraction length is computed to give the best possible precision. Custom –– The coefficients data type is specified as a custom numeric type through the CustomCoefficientsDataType property. Word and fraction lengths of the coefficients data type, specified as an autosigned numerictype with a word length of 16 and a fraction length of 15. This property applies when you set the CoefficientsDataType property to Custom. 'Full precision' –– The product output data type has full precision. 'Same as input' –– The object specifies the product output data type to be the same as that of the input data type. 'Custom' –– The product output data type is specified as a custom numeric type through the CustomProductDataType property. For more information on the product output data type, see Multiplication Data Types. This property applies when you set FullPrecisionOverride to false. Word and fraction lengths of the product data type, specified as an autosigned numeric type with a word length of 32 and a fraction length of 30. This property applies only when you set FullPrecisionOverride to false and ProductDataType to 'Custom'. 'Full precision' –– The accumulation operation has full precision. 'Same as product' –– The object specifies the accumulator data type to be the same as that of the product output data type. 'Same as input' –– The object specifies the accumulator data type to be the same as that of the input data type. 'Custom' –– The accumulator data type is specified as a custom numeric type through the CustomAccumulatorDataType property. Word and fraction lengths of the accumulator data type, specified as an autosigned numeric type with a word length of 32 and a fraction length of 30. This property applies only when you set FullPrecisionOverride to false and AccumulatorDataType to 'Custom'. 'Same as accumulator' –– The output data type is the same as that of the accumulator output data type. 'Same as input' –– The output data type is the same as that of the input data type. 'Same as product' –– The output data type is the same as that of the product output data type. 'Custom' –– The output data type is specified as a custom numeric type through the CustomOutputDataType property. Word and fraction lengths of the output data type, specified as an autosigned numeric type with a word length of 16 and a fraction length of 15. This property applies only when you set FullPrecisionOverride to false and OutputDataType to 'Custom'. 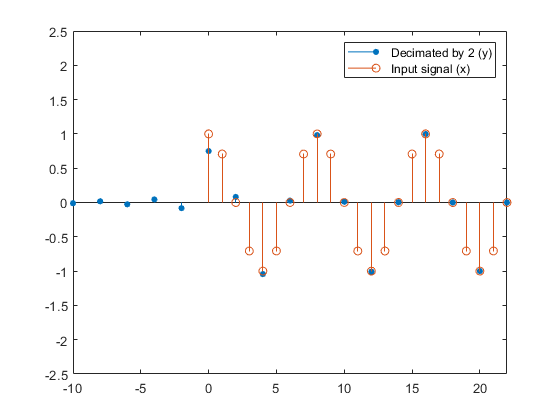 y = firdecim(x) outputs the filtered and downsampled values, y, of the input signal, x.
y = firdecim(x,num) uses the FIR filter, num, to decimate the input signal. This configuration is valid only when the 'NumeratorSource' property is set to 'Input port'. Data input, specified as a column vector or a matrix of size Ki-by-N. The number of input rows, Ki, must be a multiple of the DecimationFactor property. The input columns represent the N independent channels. This object supports variable-size input and does not support complex unsigned fixed-point inputs. This input is accepted only when the 'NumeratorSource' property is set to 'Input port'. FIR decimated output, returned as a column vector or a matrix of size Ki/M-by-N, where M is the decimation factor. This example shows how to decimate a sum of sine waves with angular frequencies of pi/4 and 2pi/3 radians/sample by a factor of two. To prevent aliasing, the FIR decimator filters out the 2pi/3 radians/sample component before downsampling. 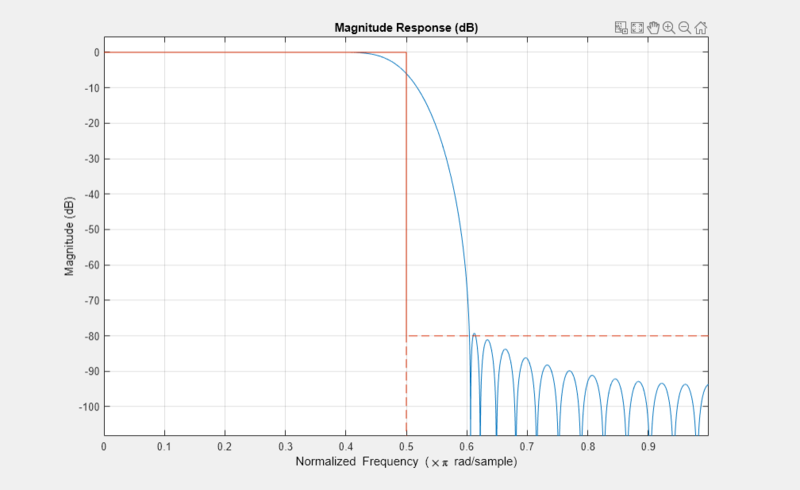 This example shows how to reduce the sampling rate of an audio signal by 1/2 and plays it. The columns of PolyphaseFilt are subfilters containing the two phases of the filter in Num. For a general downsampling factor of M , there are M phases and therefore M subfilters. Output buffer initial conditions – The FIR decimator object does not support this parameter. Rate options – The FIR decimator object does not support this parameter. Input processing The FIR decimator object does not support this parameter.